For the 5th year in a row, MPS has been shortlisted for the GP Awards! This year sees a new category and format for suppliers to the healthcare sector. The category we’ve been shortlisted for is Technology Provider of the Year, designed to provide an opportunity for entry to a broader range of suppliers which resulted in 18 applicants. The new format involved customers voting for applicants using the Awards Portal. We’ve always known our customers value the service we provide and they came through for us as we’re one of only 3 companies shortlisted for the award! The awards ceremony takes place on 30 November in London. 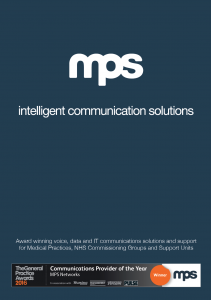 Fill in your details below to download our Healthcare Brochure. Tick the box to receive product updates, news and offers by email from us. PreviousPrevious post:Tim Docker increases Maximum Motorsport entry to three carsNextNext post:The BT ISDN Switch Off. What’s it all about?